For over 30 years, BMR's experienced team has helped Tustin businesses succeed. We knew it already, didn’t we? For sure, BMR Insurance Agency wouldn’t be celebrating over 30 years in business in Tustin if it wasn’t such a wonderful place to live. Are You Underinsured on Fire Damage Coverage? We Can Help. You can never tell how close the wildfires will get to the suburbs. We hope that your home is never destroyed by a fire, but it can happen. Especially with Southern California’s Santa Ana winds, which can whip up a simple fire and make it widespread and deadly. This is not from a disaster movie. 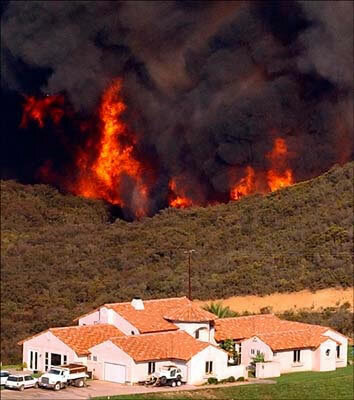 This is an actual photo from the Northridge earthquake in 1994. Why are we talking about the 19th anniversary of an earthquake? Because it’s important to remember earthquake safety all the time. The most dangerous thing about earthquakes, besides their potential devastation, is that we cannot predict them with any certainty. Hitting the Slopes This Winter? Insure Those Skis. Planning on hitting the slopes with your own skis? We haven’t had a ton of snow yet in California to make the ski season exciting. Yet….let’s hope we get a few more winter storms that make Mammoth, Tahoe and Bear Valley worth the drive for some excellent skiing on the slopes. Look at more than the sticker price when buying a new car. It’s the second week of January—have you broken any of your New Year’s resolutions yet? If one of them was to start saving pennies each month, this blog will be just what you need to have a successful resolution to feel smug about. Take care of your home, and it will last longer and provide higher resale values. As a year ends and a new one begins, many of us make resolutions about being more active, eating a better diet, weeding through an old wardrobe or cleaning out cupboards for donations to goodwill. But what about your house? It can’t make these kind of plans to spruce itself up or keep itself in shape to live a long, healthy life.